Extensis has announced Portfolio Server 9.5, a new version of its Digital Asset Management (DAM) software, designed to help small businesses and corporate teams quickly locate and access large collections of photos, graphics, documents, and videos. Portfolio Server 9.5 provides a central place to find and use files with consistent metadata information, either via a Web browser or with desktop software. This new version offers simplified setup options and new Web client features for viewing and selecting files. The package is Intel only and works with Mac OS X 10.5 (Leopard) and 10.6 (Snow Leopard). 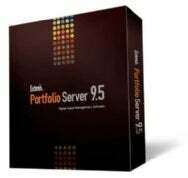 Portfolio Server 9.5 is designed for ease of use and offers simple, Web-based administration features for the remote setup of users, catalogs, and other settings. Moreover, the included MediaRich media-processing engine (from Equilibrium) has been updated, and there is new support for additional file and metadata formats. Version 9.5 includes the following new features: an updated Web client that provides a desktop-like experience; enhanced previewing that introduces flagged items, full screen, and filmstrip previews; new setup options to ease product installation and upgrades; the ability to view and manage Adobe SWF and DNG formats; offline data cataloging of removable media such as CDs and DVDs; and support for Apple Xsan. The NetPublish module includes the updated ImagePro NetPublish Web template. Portfolio Server is built on technologies such as Java J2EE, Adobe Flex, JBoss, and OpenOffice.org to enhance usability and integrate with customer workflows. An optional SQL Connect module, along with Extensis’ industry-standard database, provides greater scalability, enhanced performance, and better integration, the company says. The Professional Edition includes three client connections; the Enterprise Edition includes 10 client connections, SQL Connect, and 10 percent off add-on client connections and modules. Additional Web and desktop client connections are available for purchase for both editions. NetPublish is an optional module for delivering assets to the Web. NetMediaMAX is an optional module designed to boost scalability and performance. Portfolio Server 9.5 is available immediately in English, French, German, and Japanese for an estimated $6,416. This includes a one-year annual service agreement. Academic, government, and non-profit discounts are available. Customers with a current annual service agreement will receive the new version free of charge; upgrade pricing is also available for existing customers.